Leftover Girl Scout cookies? Too many chocolate chip cookies on hand? Want to do something with all those leftover holiday cookies? Well, have we got the solution for you: Make a milkshake! With this milkshake recipe, just use the type of cookie you have on hand, then mix it with your choice of ice cream and some milk. Blend to combine, then sit down and enjoy the fruits of your labor! Or would it be the cookies of your labor? Blend ice cream and milk in a blender. Customized cookie milkshakes are a great idea for a children's party. Put out several toppings and let the children choose their favorite cookie and ice cream flavor combos. Use small cups so the kids can taste different options, as they like to mix up traditional combinations -- and they probably want to play around with different ingredients. Line up a few different blenders to make these concoctions, then start blending and serve a few different types of milkshakes. If you want to put a fancy spin on things, you can probably find cute plastic cups to jazz up the milkshakes. The Cookie Monster: Combine Oreos and vanilla or chocolate ice cream into a smooth milkshake with a fun name. Peanut Butter Surprise: Peanut butter ice cream and Nutter Butters or peanut butter cookies...a cookie milkshake combo that you will not soon forget. (Beware of peanut allergies.) You could add a surprise by tossing in a peanut butter cup or chocolate chips. Caramel Frap: Similar to a caramel frappuccino, this cookie milkshake blends snickerdoodles and salted caramel ice cream into a Starbucks-like creation. Cookie Dough Milkshake: Traditional chocolate chip cookies and vanilla ice cream or chocolate chip cookie dough ice cream...when blended, it's bliss. Gumby Shake: Blend up Thin Mints into chocolate or chocolate chip mint ice cream and you've got your own version of a Shamrock shake. 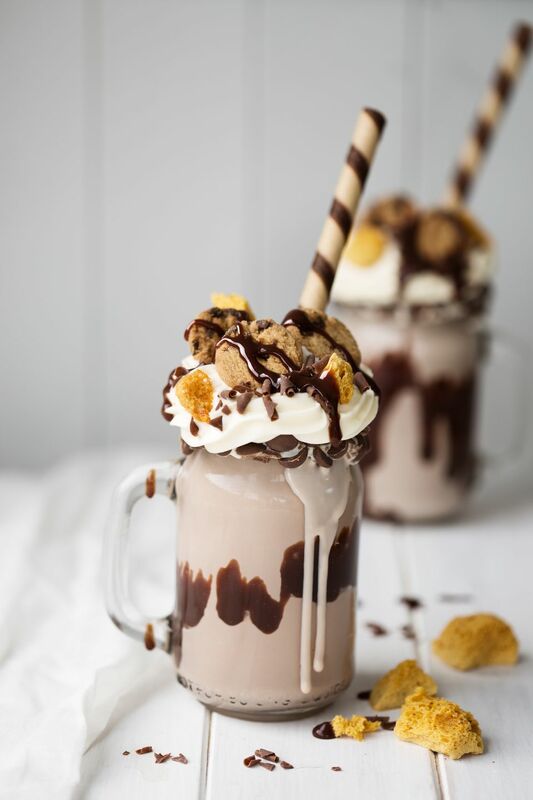 Another way to create a cute presentation with your cookie milkshakes is to place a cookie on top of the milkshake. Poke a hole through it before you put the cookie on top and then stick a straw through the cookie. Or crumble cookie bits on top of the milkshake so kids can see the kinds of cookies involved. You can always pre-make the cookie milkshakes and then freeze them prior to serving.